Click on book to purchase now! Do you have your share of struggles? Do you struggle when life hands you difficulties? Even failures? Do tears simply wreak havoc on your mascara? Life’s daily grind does not have to derail our joy. In What Didn’t Kill Me Made Me Funny, Sally challenges us to see life as a “work in progress,” where frustration and funny go hand in hand. 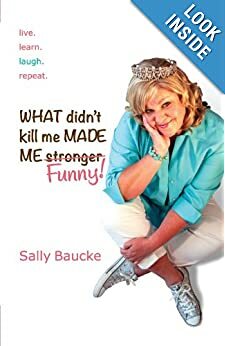 Walk alongside Sally on her hilarious journey, as she tackles everyday insecurities with her signature brand of self-effacing humor. From BFFs and babies to womanhood and work, you will find yourself laughing out loud at this true tale of a directionally-challenged, hair-obsessed, tiara-toting Royal wanna-be. CLICK ON THE CDs above to purchase them now!